This seems to be as close as Newsom is willing to get to the crowds of commuters on Muni. San Francisco Mayor Gavin Newsom is regularly spotted in his chauffeured Chevy Tahoe, and has certainly posed for plenty a photo-op in his Tesla Roadster, but he's yet to turn up on a Muni bus or train. If you do spot him strap-hanging, be sure to have your cellphone camera at the ready, because you could win a free fast pass from the folks behind the Where's Gavin? web site. The mayor's choice of transportation has come under fire thanks to the Municipal Transportation Authority's budget shortfall, and his own rhetoric positioning himself as a champion of the environment and green living. A spokesman for the mayor told the San Francisco Chronicle in April that when Newsom rides the bus, he rides "incognito," with his signature coiffure tucked into a baseball cap. But since the contest was launched on May 12, no tall, skinny, grinning politicians have been spotted, much less captured on camera in the wild. Granted, the mayor hasn't been spending much time in San Francisco, or even California, as he campaigns for Governor. 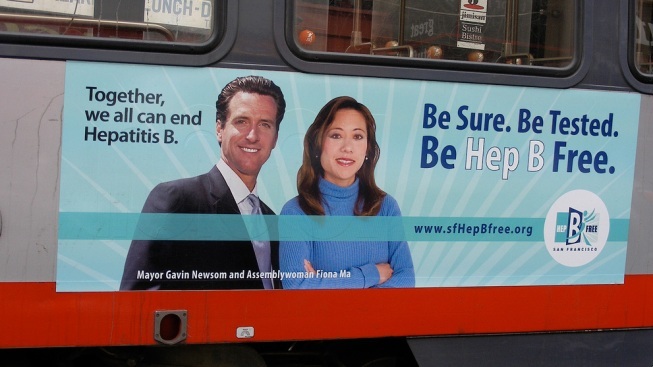 At this rate, Muni riders will probably turn up evidence of Bigfoot before they find Newsom. Photo by Nick Douglas. Jackson West would like to note that even Willie Brown regularly rode Muni.